This is a collection of the best single property WordPress real estate themes for building a property showcase website. These real estate WordPress themes have been specifically designed to showcase and sell a single property. They’re ideal if you’re trying to rent or sell your house or apartment by yourself, or if you have a vacation rental property and need a nice website to advertise it and take bookings. Property developers could also use themes to showcase new houses, apartments, shopping malls, resorts, hotels or other properties there building. WordPress is the ideal platform for building a property showcase website. WordPress is free, open source and easy to use. There are heaps of great free and premium plugins available to extend your site with more functionality. Plus these purpose build single property themes are cheap and have a heap of nice features and options so you can get a professional website up quickly and easily. If your looking for multi property real estate WordPress themes see our comprehensive collection of the best Real Estate WordPress Themes. The Windor WordPress theme is designed for showcasing single properties or a new property development. The premium theme has a bold and modern design with a full screen homepage image and single page website layout (but can also be used for a full website). Its ideal for showcasing a new apartment complex, office block, or house. It has a pop-up menu, side scroller, visual composer for custom layouts, mobile responsive design and easy customization options. The Home State theme has a clean and professional design that allows you to display everything about your property on the one page. It’s ideal for selling a house, villa, apartment, townhouse, and lets you display all the information and photos you want to showcase your property in style. The theme also has a multi-page option useful for real estate companies. 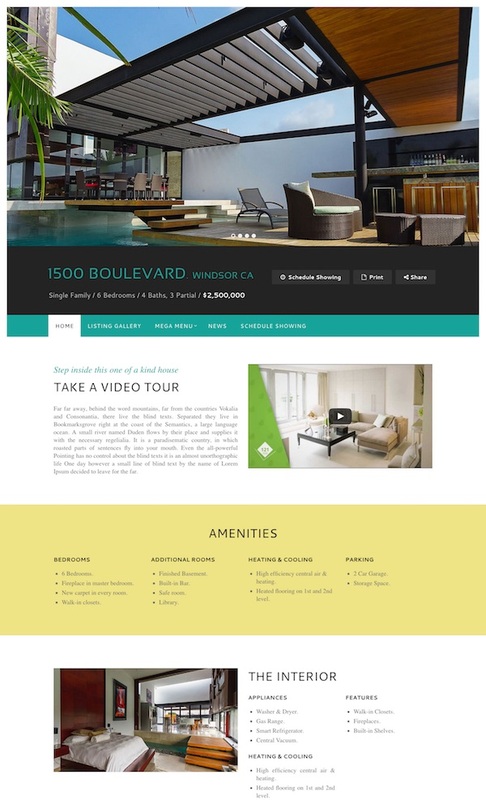 Boulevard is a real estate WordPress theme designed for single property showcase websites. It has a simple and easy to use design with a nice large featured image up the top with sections below to display all the information about the property. It come with a page builder for easily editing your content, unlimited color options, responsive layout and more. The Dream Land WordPress theme has a beautiful and modern design that’s quite minimalist and ensures your properties photos and features are what stands out. The homepage has a big featured slider followed by sections for all the details about your property, a photo gallery, about the agent, FAQ, Google map, directions and contact form. The theme is ideal for selling your own home or for an agent to use to create a dedicated website to showcase a special luxury property or trophy home they’re trying to sell. DreamHome is a single property WordPress real estate theme ideal for renting or selling your house, apartment, villa or land. It comes with two different options – a single page parallax version or multi page version. The theme has a modern and trendy design that’s mobile responsive and retina ready. It comes with the WP Quick Booking Manager Pro plugin for easily adding booking and payment functionality. Other features include: dynamic nearby places with Google map, advanced theme options, Google fonts, unlimited colors, photo gallery and more. The Gapura WordPress theme is a single property theme that provides a full multi page website for selling houses, apartments, villas, condos and other property. It has a modern and clear design with a fully mobile responsive layout. Its simple and easy to use and perfect for individuals or real estate companies. It allows you to display large beautiful photos and all the information and details about your property. 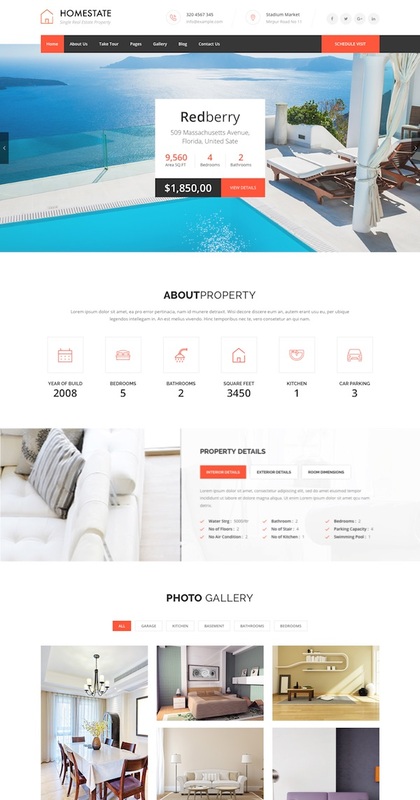 The Single property real estate WordPress theme Apartt Villa has a bold and eye catching design ideal for selling a property or displaying a vacation rental property and accepting bookings. It has a big photo slider on the homepage with a prominent strip to display the vital information about the property. You can also display all the property information and pictures. It has a couple of homepage layout options, parallax effects, unique effects and functionality, visual composer page builder, Google fonts and more. Dream Villa is an attractive and professional real estate WordPress theme designed for a single property website. Perfect for real estate agencies needing a dedicated website to showcase a special property or individuals trying to sell or lease their own property. The theme is built using the Visual Composer plugin and comes with two different options – multi-page or single page parallax version. Its integrated with the WP Quick Booking Manager Pro Plugin that allows you to rent your property and accept payments online with PayPal. Some of the other key features include: 3 homepage variations, mobile responsive, dynamic nearby places with Google maps, unlimited color variations, fonts, sortable photo gallery, floor plans and more. 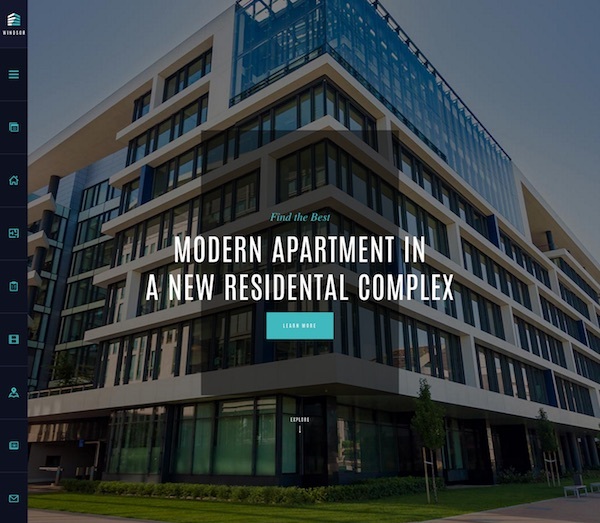 Condio is a nice single property website WordPress theme perfect for promoting and showcasing your new real estate development project. It has a conversion focused design that allows you to collect information from your visitors and present all the information about your development. It comes with 5 different homepage options, map with markers, property listing details, full screen video homepage options, count down timer, photo and video galleries, unlimited sidebars and colors, fully responsive and more. For sale by owner is becoming more popular these days as people try to cut out greedy real estate agents from the selling process. The professional Quick Sale real estate theme has been designed specifically for property owners wanting to create a website to sell their own property. You can use the theme to sell or showcase a single property or modify it for use as a real estate agency or corporate page. It features a powerful options panel, color management, lots of header options, online appointment booking system, events calendar, 27 gallery styles, WooCommerce support, parallax and video backgrounds, visual composer, translations support and more. Solus is an easy to use and fully featured WordPress theme for a single property display website. The premium theme has a simple and functional design for showcasing your property. 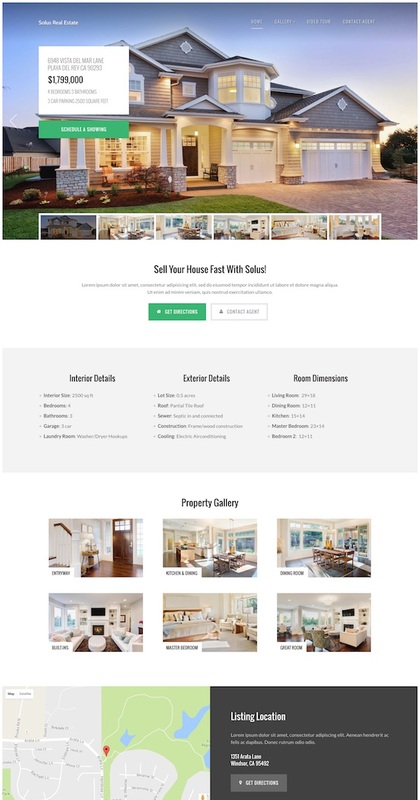 It features a mobile responsive layout, unlimited color schemes, featured header image, section for property details and features, photo gallery, map, video tour page and more.